Send us the funny things your kids (or other people’s kids) write! Email a jpeg image to mcfadden.chase@gmail.com or leanneshirtliffe@gmail.com. Pieces can be posted with credit or anonymously, and if you have a personal blog/site you’d like us to link to, we will. 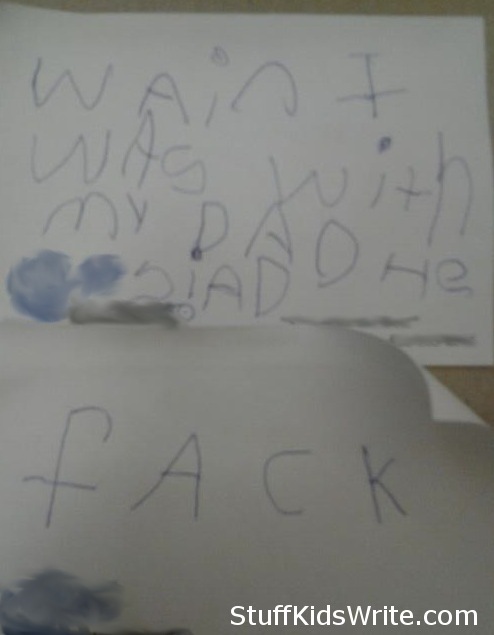 Posted on October 9, 2012, in For Dads, Misspelled, Notes and tagged children writing, funny, funny kids writing, Humor, kid writing, Stuff Kids Write. Bookmark the permalink. Leave a comment.